In all the hubbub over Gen. Stanley McChrystal’s disastrous Rolling Stone profile which sparked an international furor today, I notice there hasn’t been time yet for most Beltway armchair analysts to focus on the article’s actual depiction of the state of American policy in Afghanistan. Is that an unfair assessment, too bleak? I’ve been a fairly consistent supporter of the Afghanistan war since the inception, but even I was struck that a “senior military official in Kabul” is quoted in the article saying: “There’s a possibility we could ask for another surge of U.S. forces next summer if we see success here.” So even hypothesized success of McChrystal’s current surge would result in more troops, not less, heading for the fight – a decade in. I didn’t think I would have to write this same kind of observation twice within a year. But today, on D-Day, I notice yet again a striking difference between Google and Microsoft. And in this case, one can almost read the evidence as a snub from Google to the United States, to the nations who united in sacrifice during World War II, and to President Obama on a day of his personal leadership in commemorating international war and peace. Today is of course D-Day, the 65th anniversary of a day in which over 2,000 American soldiers lost their lives, leading the way in the greatest military operation in the history of the world, as the initial landing to liberate Europe and the beginning of the end of the Nazi empire. Google and Microsoft are two great American companies, which operate globally. Each has a public face to the world through signature online properties – their search engines. In Google’s case, that page at Google.com is their ne plus ultra public face, since they are at core a mighty search engine. Take a look at the two pages today. 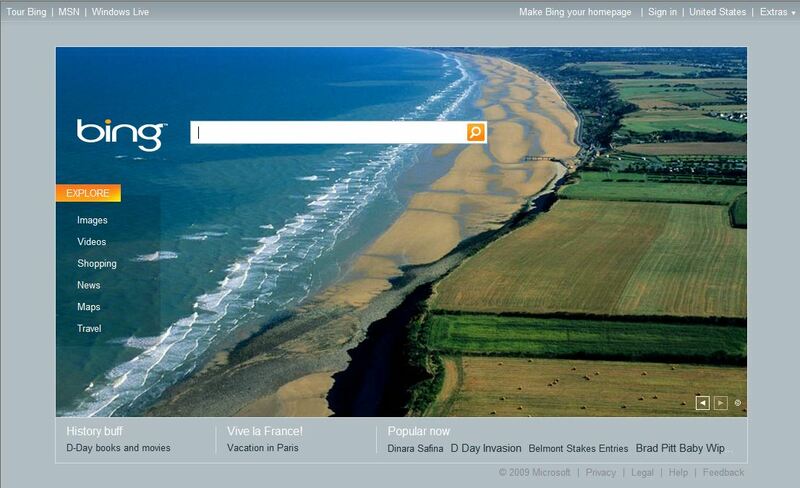 Microsoft’s Bing search-engine uses its home page to commemorate D-Day, with a dramatic photograph of Normandy Beach today, and mouse-over popups providing historical highlights and links to more information on the battle’s signficance to World War II and to world history. 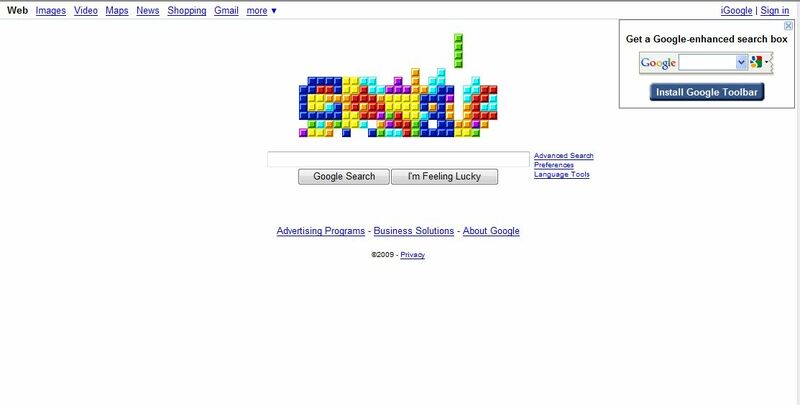 Google uses its home page to commemorate the 25th anniversary of the invention of the computer game Tetris. Just as I noted on Columbus Day, this doesn’t appear to be a localization issue, or an issue of appealing to a global audience – both Microsoft and Google know my location, and in fact each is serving up a page targeted for me in the United States. Don’t get me wrong: Tetris was an amusing and absorbing game. As a young guy I spent hours dropping the bars and shapes to fit into the rising pile below. But at certain moments in life, you put aside childish things. Unless you’re trying to make some other kind of statement. Note: I am a Microsoft employee. But this is not a Microsoft corporate blog, it’s my personal blog – and I’ve been known to tweak Microsoft here frequently as well. This is my personal observation space. I have to admit I am puzzled – and personally appalled – by the decision-making over at the Googleplex, and the statement they choose to send to the world. President Obama is leading our delegation himself at Normandy Beach today, for the international event with other world leaders remembering a moment of global importance. Self-evidently Eric Schmidt and the Google gang weren’t on board with that, and by their way of thinking saw something more significant to mark. One particularly striking point to note about this: That level of funding [an increase to ‘more than three percent of GDP’] would almost meet the amount of money spent on defense. To some extent, that may simply represent a shift in where on the budget certain funds are accounted for, as defense spending has always been a key driver of American scientific research, but it’s still a sharp difference from the normal state of affairs. I’ve written before (“How to Find Research“) about the need for increased R&D spending, and about the role of the White House Office of Science & Technology Policy in its main role: advising the President and others within the Executive Office of the President on the impacts of science and technology on domestic and international affairs. OSTP does the hard work – but it is guided in part by the President’s Council of Advisors on Science and Technology, or PCAST. This group can be a quiet backwater – as it has been on and off for years – or it has the potential to be a dynamic leading voice in advising the Administration on S&T policies, particularly in investments in scientific research and tech innovation. It looks like we’re on the dynamic upswing, given that President Obama also used today’s high-profile announcement to name his appointments to an all-new PCAST. A word-cloud produced (quickly) by the Los Angeles Times. Befiitting the social-media aspect, the paper published it on Twitter immediately; don’t know if it will even be published as a graphic in the day-old “newspaper” printed and distributed tomorrow. The New York Times, meanwhile, has the same for every previous presidential inaugural address as well – interesting to scroll back and forth to notice trends in presidential intentions. Some of the best set of mashups using cutting-edge technology, to my mind, are the photographs from media and members of the crowd on the Mall, being synthed into 3D Photosynth virtual models. Really cool! Twitter and other social-media services and channels appeared to hold up well under the crush of traffic. I was pleasantly surprised with the performance of Microsoft’s official streaming of the entire ceremony for the Presidential Inaugural Committee, using Silverlight (same technology was used really nicely for global streaming of the Summer Olympics last year). In fact, the online streaming was markedly smoother than the ability of the TV networks to speak to reporters reliably down on the Mall – it appeared that network and cellular traffic was constantly cutting out on remote video and microphones. A moving day, brought to more people than ever before through technology.